On Saturday, October 28, 2017, over 1200 people showed up at Parker Memorial Park between the hours of noon and 8:00 p.m. to take part in the family fun at Flour Fest, a community event put on by the Flour Bluff Business Association and sponsored by County Commissioners Brent Chesney and Mike Pusley, Michael Morgan of State Farm, Javier Wiley of HEB, Roshan Bhakta of Candlewood Suites Flour Bluff/NAS, and Dr. Mohamed Hassan of Children’s Center Flour Bluff. 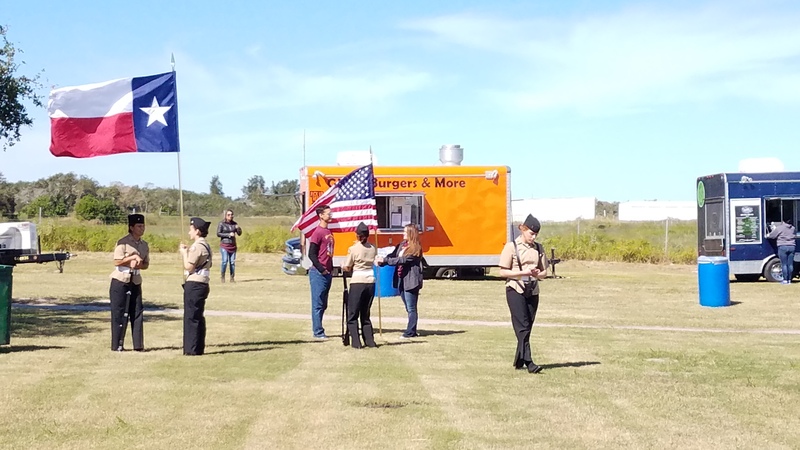 The award-winning, nationally renowned Flour Bluff NJROTC Color Guard provided cadets for the opening ceremonies, parking detail, and clean-up detail as part of their service duties. The Pct. 2 Constable’s office provided security for the event through its reserve officers along with several Corpus Christi Police Department officers. Beer and wine catering by CC Liquor Catering, owners Megan (Dulak) and John Gordon. Vela envisioned something different when he thought of Flour Fest. “Our first annual Flour Fest was at Funtrackers. I enjoyed the event, but I wasn’t happy with the location and other things tied to the location. When I think festival, I don’t picture arcades and go karts. I picture what it was this year, open air, stage in a field, trees, and open grass areas.” Another FBBA board member suggested Parker Park, a decision Vela liked. Planning the event started 10 months before it came to be. “I feel the hardest part was the weeks leading into the event making sure everything was in place,” said Vela. “Seeing all our hard work pay off, seeing all the people have an amazing time, seeing something we worked so hard on come together,” Vela added in response to what he liked best about the event. “All the bands this year were amazing, and I wouldn’t mind bringing them back every year. Next year I would even like to hire a national touring band to close out the night.” He also said he would like to see the event go two hours longer next year. The FBBA would also like to thank Little Caesar’s, Dominoes, and Funtrackers for donations of coupons or food for the event and to all the vendors and community organizations that provided fun, candy, and prizes for the children. They especially want to thank all who came to the festival and partook in the fun and helped make the event worthwhile for everyone.